Highland Cow Art - Highland Cattle paintings and prints by Hilary Barker at Mid Torrie Farm, Callander in Scotland. 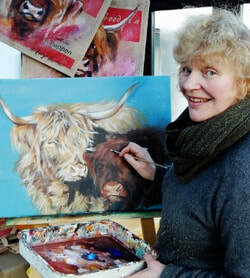 ﻿Welcome to Highland Cow Art - a website featuring paintings by Hilary Barker. If you love Highland Cows, this is the place for you! Originals and prints, featuring the most handsome of cattle - the Highlander. NEW - Click on Limited edition prints, or Canvas Textured Prints for several new images! "Cooling off" Now available as limited edition print @ £50plus £5 p&p. Image size is 32 x 37.5 cm and there is a 3 cm white border all round. I hope you will enjoy browsing these pages - please contact me, Hilary, if you would like more information. You are also most welcome to visit our studio by arrangement. Just click on Contact to send a message. OR, if you have something in mind that you'd like me to paint, please contact me for a chat. I can send artwork almost anywhere around the world. "Two Highland lassies " now available as canvas textured print. Please visit our other website www.barkershighlandbeef.co.uk for information on our Highland Cattle and our gorgeous self catering holiday cottage. www.highlandcattlesociety.com for more information on Highland Cattle.